5 Tips For Hosting The Perfect Playdate - Mummy's Gone Mad! | Mummy's Gone Mad! Most parents think play dates are a challenge. Entertaining an orchestra of whining children can be trying for even the mildest mannered of Mums and Dads. However, play dates are a great way to develop your children’s communication skills and help teach the importance of sharing and kindness towards others. Organising a play date for your children and their friends does not have to be as stressful as you may think. Follow these tips for hosting the perfect play date and you might just have as much fun as the kids. Invite only a small number of children to each play date. If you invite too many and the event descends into chaos, you will never want to host another play date. There will be far less pressure on you if you are hosting a small number of people and with a smaller group it will be easier for everyone to get to know each other. Start with three children and their parents. When you feel like a pro play date host, think about inviting another family or two. Make sure they have plenty of things to keep them entertained. As parents know, young children can become disinterested in activities very quickly. It is important to have plenty of play options available for when their interest in one activity begins to dwindle. It is a good idea to request that each child bring along a toy or game. This way there is less pressure on you to provide all the entertainment. When the weather is bad outside, arts and crafts or baking are a fun and educational way to keep the kids entertained. An interactive film, TV programme or game involving singing and dancing, for example, is another effective way to keep the little ones amused indoors. If it’s a lovely day, the kids will be entertained for a long time with an outdoor activity centre, like those provided by Totally Swing Sets. You could also use the time to get them interested in nature and gardening by providing some plants for them to grow. If you are providing refreshments, don’t spend lots of time making complicated treats. There are plenty of options for simple and nutritional snacks for kids. Juice cartons involve no preparation and are not messy. Slices of apple dipped in peanut butter are healthy, easy to prepare and will be gobbled up enthusiastically by all the kids. 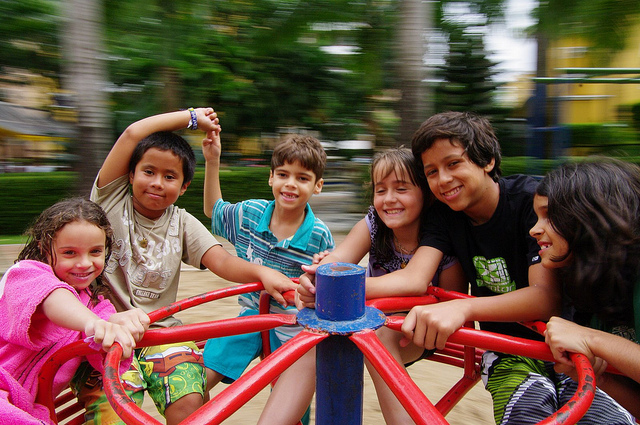 Playdates are an opportunity for your kids to have fun with their friends and develop valuable social skills. However, they are also an opportunity for you to have fun and catch up with other parents. By following these tips, you are sure to host the perfect playdate and be able to enjoy yourself while doing it.